Sometimes you really should have seen it coming, and this is one of those times. I'm not talking about plot twists, I'm talking about quality level, with which Adrift has a major problem. And again, we should have seen it coming, because the signs were pointing toward 'problematic' from the get go. Both of this film's stars were made famous by YA dystopian novels, and its director could barely make Everest something other than a snooze fest. Not good, and not improved by bringing all parties together, tackling a true story (that's not very interesting), and trying to make audiences believe that Shailene Woodley and Sam Claflin look like/are regular, schlubby people. Tami is a free spirit, has been since she left home when she was a teenager, a kid set on seeing the world outside of San Diego and not being pinned down by her family's dysfunction. Richard is a Brit who roams the globe in a sailboat, whose own family story isn't much prettier, a young man who loves being alone in the middle of the blue. The pair meet each other in Tahiti, fall in love, and begin to think that two lone wolves might be able to coexist in a very small pack. When Richard is offered a lucrative job sailing a yacht back to the States, he can't turn it down, and he can't leave Tami behind. But when a storm hits the small ship, the couple will have to battle the waves in order to survive, and will need each other to hold on to any sliver of hope. The first problem comes in the form of the story, which isn't all that fascinating. Survival on the ocean, sure, that's mildly cool, but this isn't a famous story for a reason, we've never heard of these people or their plight because it's not very awesome. 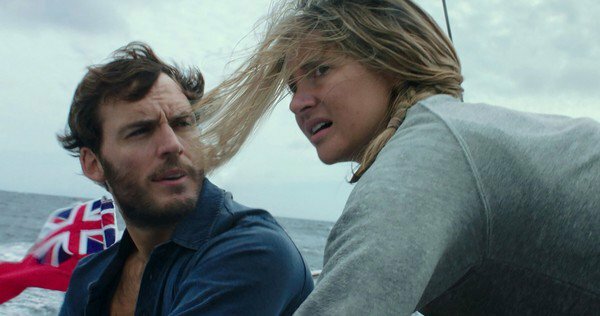 I couldn't go through what they did, I'm not saying that attempting to survive at sea is easy, I'm just saying that, in order to make the tale into a film, there ought to be some other element that compels us to watch. That may have been intended to be the love story, that was perhaps the hook, but I never really cared that much, and it's most likely because of the actors. Neither is that good; I feel like that's something we ought to be ready to acknowledge. Woodley has attempted to come out of her Young Adult shell, specifically with an adult role in White Bird in a Blizzard in which she did really well, but it hasn't exactly worked further yet. Claflin has tried the same, was OK in Their Finest, but hasn't yet had his coming out. This was their chance to shine, to catch our eye, but Woodley especially only caught it for the wrong reasons. She was affected, that's the simplest way I can put it, she's an affected actress who has a hard time giving an honest, unfiltered performance. It's almost a gut reaction, audiences can feel when you're not completely authentic and aren't melting into your characters; I just don't think she has the ability to reach the same plane as some of her contemporaries. So the movie didn't work, mostly because she didn't work, and generally because we weren't given enough reason to care.